The Bowie Junior High cross country teams opened the 2018 running season at the Decatur Assault of Eagle Summit. Both the seventh grade and eighth grade girls solidified a second-place team finish. The seventh graders were led by Ziba Robbins, who finished in fourth place with a time of 16:49.1. Samantha Clarke ran her way to a seventh-place finish (17:09.6) while Sayler Richey finished in sixteenth (18:11.3). Julia Witt was the top Bowie runner for the eighth-grade girls with a ninth-place finish and time of 16:43.0. Kenzie Short crossed the finish line in fifteenth place with a time of 17:59.0, followed closely by Jorah Villarreal in seventeenth (18:06.0). 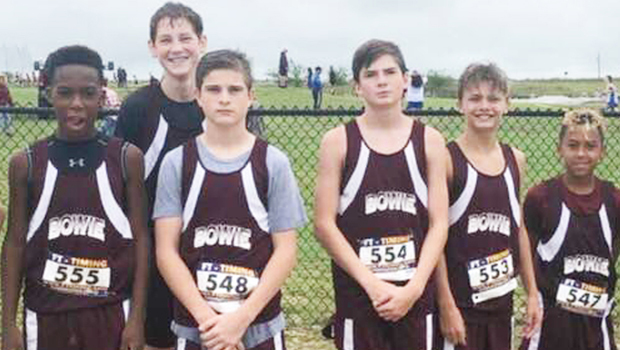 Bowie’s Case Curry raced to a ninth-place finish with a time of 15:13.7 in the seventh-grade boys 3,200-meter run, followed by Andrew Sandhoff in tenth place (15:20.9) and Brady Lawhorn in thirteenth (15:41.6). Nathan Rodgers led the Rabbits in the eighth grade 3,200-meter race, finishing in twenty-first place with a time of 15:36.5. A.J. Whatley was second for Bowie, finishing thirtieth individually with a time of 16:23.4, followed by Kynan DeMoss, 16:35.7, in thirty-second place. The Bowie eighth grade boys were joined by Saint Jo. Kile Thurman led the Panthers with a fifth-place finish, crossing the finish line with a time of 13.37.0. Collin Thomas finished twentieth at 15:27.8 and Joshua Vogel, forty second, with a time of 17:12.0. Overall, Bowie Junior High Cross Country Coach Diane Weber felt it was a very successful first meet. Three Saint Jo Panthers also ran in the varsity division. Kassidy Pitman represented the Lady Panthers, finishing in twenty seventh place with a time of 19:50.0. Meanwhile, Logan Morman and Grant Stiteler ran the 5,000-meter boy’s varsity course, with Morman landing in twenty second place with a time of 19:54.1 and Stiteler earning 44th place with a time of 25:06.5. For a list of full results, pick up a copy of the mid-week edition of the Bowie News.